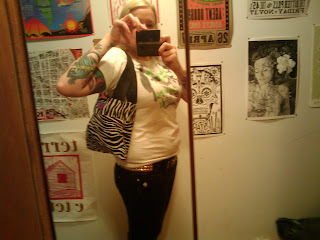 Thanks to my good friend Katie for this cool bag she made for me! Its zebra print with a perfectly stitched black lining and rad purple plastic button closure with messenger bag nylon straps. I love it! Here is a pic of her creation modeled by me! A hot bag for a hot lady.